This haul is by far the most overdue haul posted on this blog. I’ve been using these products for nearly a month now and I have been absolutely obsessed. All purchases obviously enabled by my dearest green beauty blogging friends, and I salute y’all for that —you know who you are! This was not an impulse decision, but after months of having inflamed and stressed skin I decided it was time for some skincare changes and finally checked out my Amazingy basket.. That and the fact that my top shelf was running rather low in comparison to my last showcase. 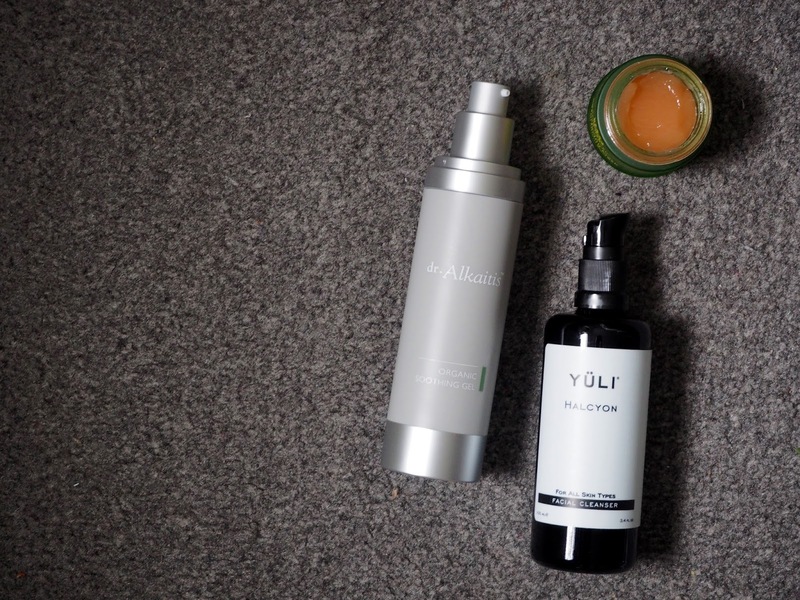 To be really honest, I probably didn’t need another cleanser, but with the green beauty community raving about Yüli Halcyon I just couldn’t resist. It’s a different texture to what I’m used to. It looks like a gel cleanser, but it feels nothing like it, as it kind of disappears into the skin. I use about 2-3 pumps on damp skin and massage it in for a minute or two, then rinse. It’s suitable for all skin types and contains a blend of pure and organic ingredients that soothe and calm the skin, such as enzymes, peptides and antioxidants. If you’d like to read more about the ingredients, Jade’s written a detailed post explaining each ingredient over at her blog. Despite having played with it for a lil’ while now, I can’t say I’ve noticed any major skin changes that I can credit to this only. I’ll report back. Dr. Alkaitis’s Organic Soothing Gel on the other hand, has changed my skin for the better. A lot. A side note to my American readers: Dr. Alkaitis has different packaging in the States and Europe, hence the foreign silver packaging. All products contain 100% organic and raw ingredients for the products to work the most effective. It’s a very runny/watery consistency, which is more similar to an emulsion or toner, rather than a gel. I apply this twice a day, right after I tone my face and I use about 3-4 pumps. What I’ve noticed is that my skin is looking so much clearer and less inflamed —I noticed a difference after the first night. Of course I’ve been trying out a few other bits, which I think have helped, but this is definitely the hero. I’ll do a full blog post on this, as it deserves to be praised in more than just 150 words.